Purchasing tyres can be incredibly expensive for your car and if you're anything like our Yorkshire founder, Nick, you'll want to make sure you get the most out of those tyres. Whilst you can't prevent them from wearing with time, you can change the rate at which they wear with our 3 simple tips. 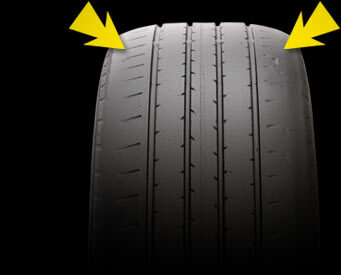 One of the most common types of tyre wear we see, are the shoulders of a tyre going bald (as in the image below). This kind of wear is generally caused by tyres being used whilst underinflated. Another wear, albeit less common, is where tyres are overinflated and the centre section of the tyre goes bald but the outer edges have plenty of tread left on them. So checking your tyre pressures at least once a month is really important to prolong the life of your tyres. Remember too, that your tyre pressures will depend upon the load of the car. So if you regularly travel with a five people in the car then you're going to need a higher tyre pressure, where as if you do the daily commute on your own, you'll need a lower tyre pressure. Most owners manuals now include different tyre pressures that are dependent upon the load the car is carrying so remember to check it. We see so many tyres that have been subjected to harsh braking and accelerating and this is a real killer for a tyre, sometimes meaning that you get less than 5,000 miles out of a tyre before it's time to replace it. The harder you brake and in particular accelerate, the more pressure you put on the tyre and you make it work harder. With harsh movements on the tyre, chunks of the tyres tread are literally ripped away from the tyre leaving a distinctive pattern. We've said it before and we'll continue to say it, regularly maintaining and servicing your car will help reduce tyre wear. You might not know what you you're looking at, but your mechanic does and they have seen the signs of abnormal tyre wear which may be caused by steering geometry, suspension setup or similar. This allows you to fix the problem before it destroys your tyres.